Do you love the two-piece dress trend this season but are not quite ready to take the plunge? This adorable a-line mock-two-piece short prom dress will give you the look you want for your next semi-formal event. 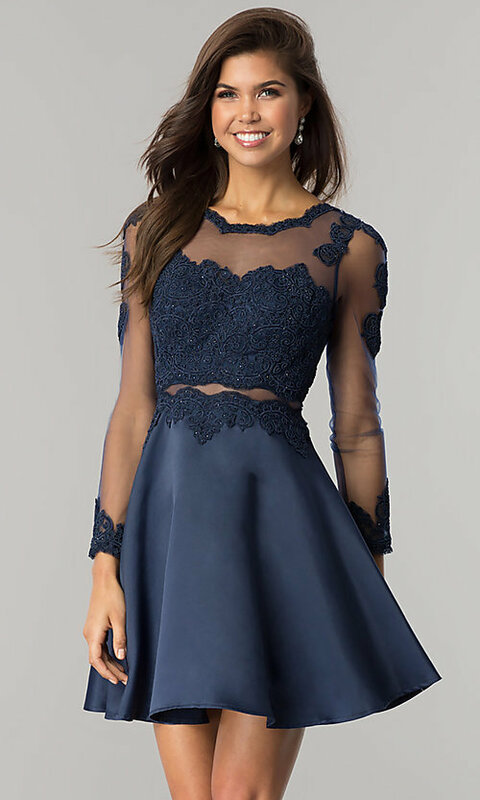 The long-sleeve illusion bodice features is beautifully decorated with rhinestone-studded embroidered-lace applique. 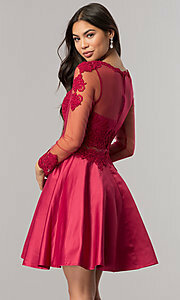 The bateau neckline, waist and sleeves of this short prom dress are trimmed with embroidered-applique trim. The above-the-knee satin skirt begins at the natural waist. All eyes will be on you in this daring, but not over-the-top, trendy looking mock two-piece short prom dress.